Whenever you go off touring by bike you need to get in touch with others. To help keep the roads and paths you ride on safe you can also contact your local councils. This area has links to a handful of sites we think are worthwhile visiting. If you know of others contact the webmaster. 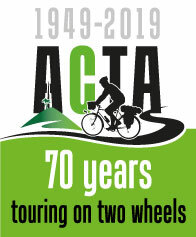 Many bike shops will give discounts to club members if you identify yourself as a member of ACTA.